To pay more is the easy way. In fact, the solution possibilities to the problem are many. You must obey the law, always, not only when they grab you by your special place. Our aims are absolutely clear: They are a high living standard in the country and a secure, free and comfortable life. Russia needs a strong state power and must have it. But I am not calling for totalitarianism. Nobody should pin their hopes on a miracle. Russia will not soon become, if it ever becomes, a second copy of the United States or England – where liberal value have deep historic roots. The strengthening of our statehood is, at times, deliberately interpreted as authoritarianism. I think the American people should express their preferences, and we’ll accept their choice. The democratic choice Russian people made in the early 90’s is final. Russia is a part of European culture. Therefore, it is with difficulty that I imagine NATO as an enemy. History proves that all dictatorships, all authoritarian forms of government are transient. Only democratic systems are not transient. Whatever the shortcomings, mankind has not devised anything superior. Anyone who doesn’t regret the passing of the Soviet Union has no heart. Anyone who wants it restored has no brains. Vladimir Vladimirovich Putin born is a Russian politician who has been the President of Russia since 7 May 2012. 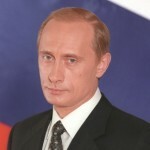 Putin previously served as President from 2000 to 2008, and as Prime Minister of Russia from 1999 to 2000 and again from 2008 to 2012. Putin was also previously the Chairman of United Russia.